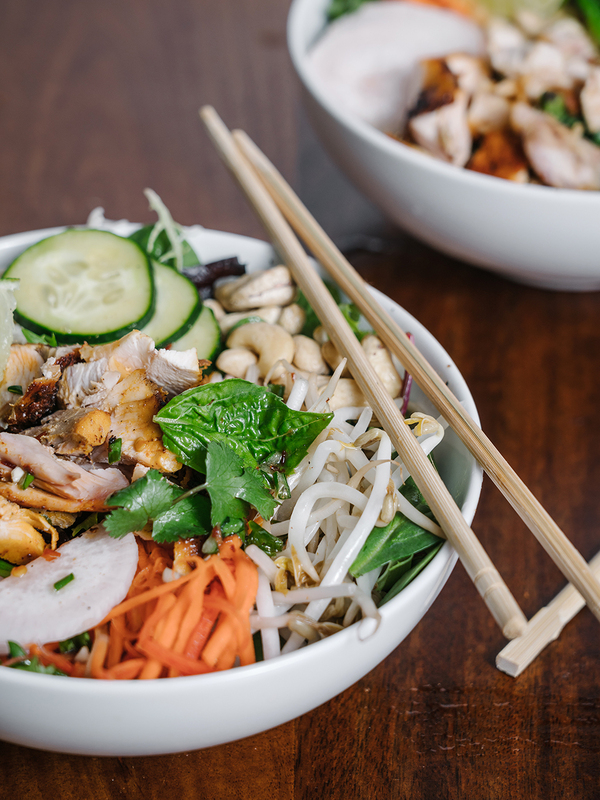 Lately I have been craving this delicious bún bowl that I get from a local Vietnamese place. 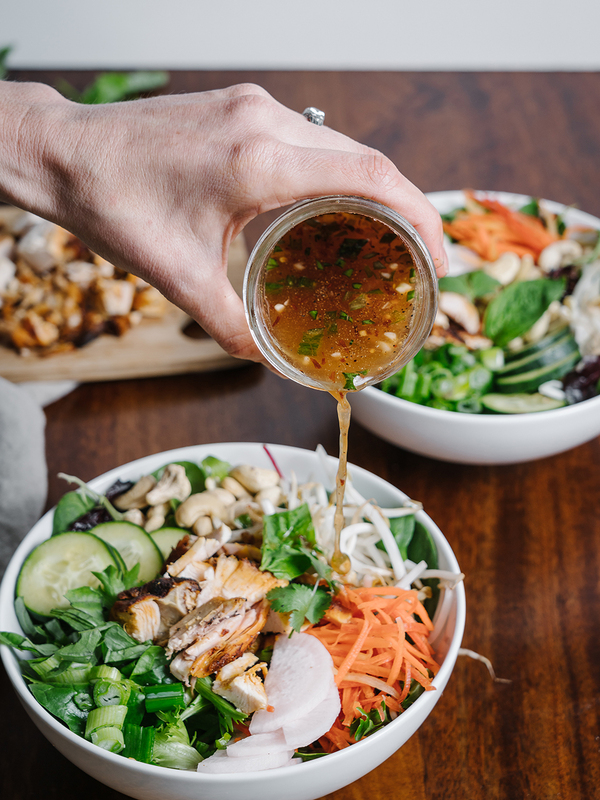 There is something about the flavors of this bowl that are impossible to resist. It’s all about the layers. 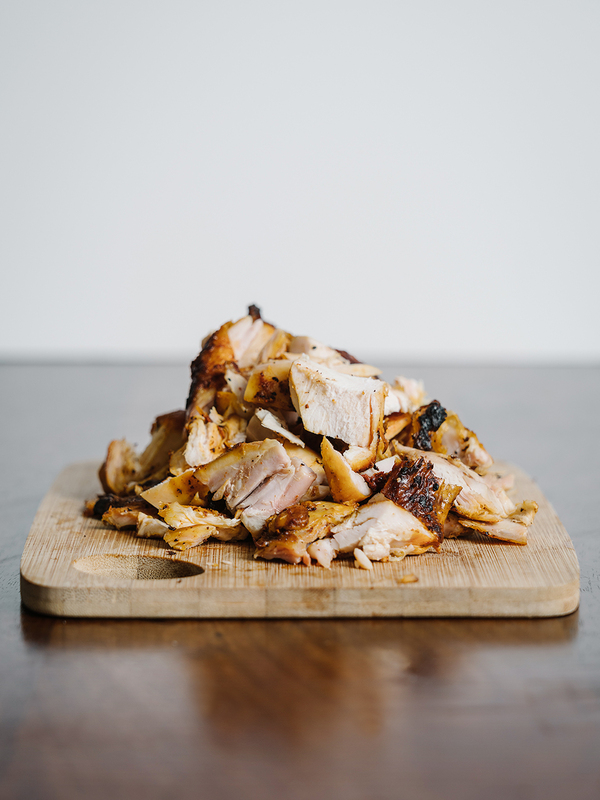 There’s a kick of spice, mixed with the freshness of crispy cold vegetables, flavorful herbs, finished with the rich savory flavor of grilled chicken. I’ll admit my recipe still doesn’t quite get to the level of my favorite Vietnamese place but it’s pretty close. 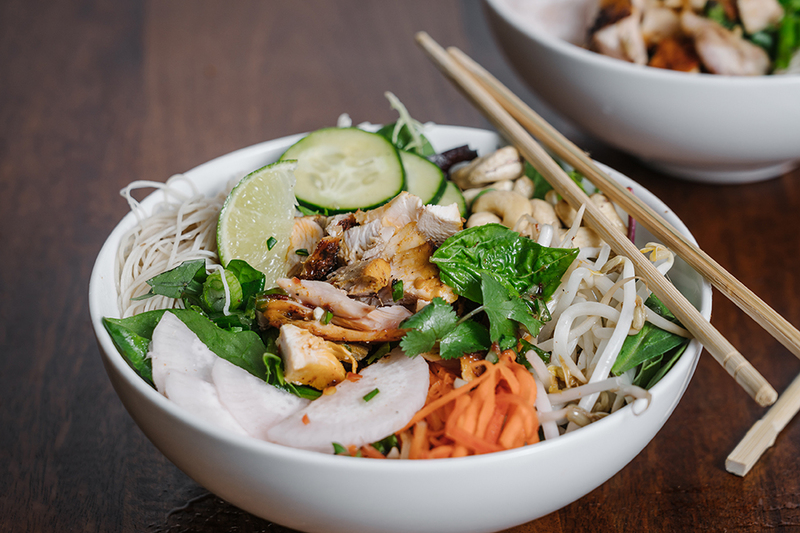 So a bun bowl is sort of comparable to a salad. It’s served cold but with a base of thin rice noodles and topped with warm grilled meat. 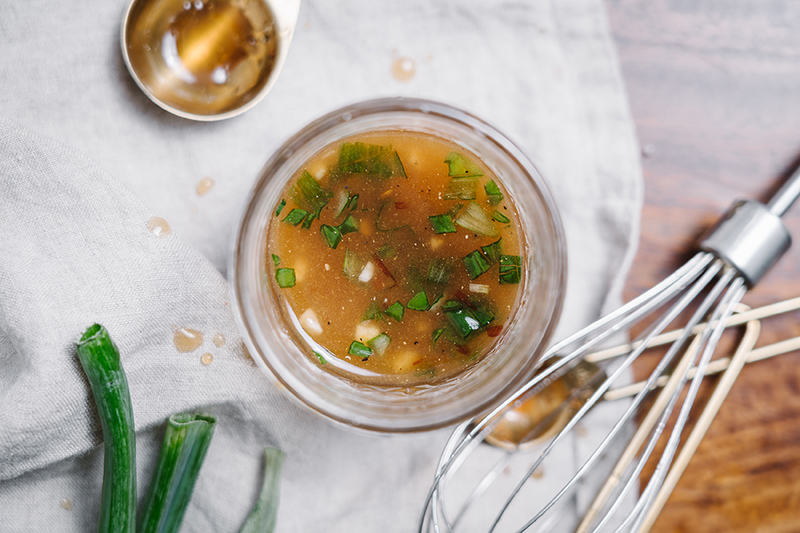 The dressing is simple, salty, and flavorful, traditionally called a nước chấm sauce. To me this salad is almost like eating a deconstructed spring roll! 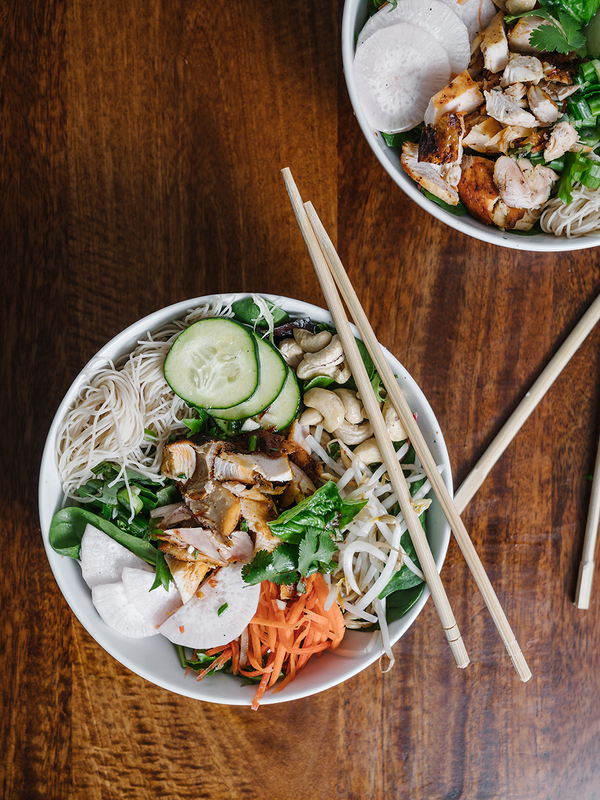 I think this Vietnamese Noodle Bowl is the perfect introduction into spring too. It’s cold and fresh but also savory and spicy. It’s really the best of both worlds warm but still fresh. This is also a fantastic lunch because you can prep it at the beginning of the week and it’s super easy. Then just make a few bowls in airtight containers and just pour your dressing over before you eat it. Lunches can be so hard some times and a plain old salad certainly gets old. I love this as a healthy, flavorful alternative. 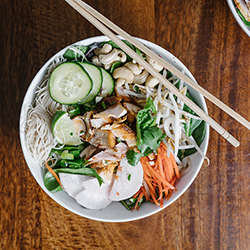 A kick of spice, mixed with the freshness of crispy cold vegetables, flavorful herbs, finished with the rich savory flavor of grilled chicken, you’ll love this delish lunch or dinner bowl. Boil water and cook brown rice noodles according to package. Layer ingredients in a bowl, the proportions are up to you! I like half noodles, half green and extra pickled veggies. Make dressing: combine water and sugar in a bowl. Add fish sauce and lime in increments until the flavor is to your liking. Finally add garlic and whisk. Drizzle sauce over bowl and enjoy! 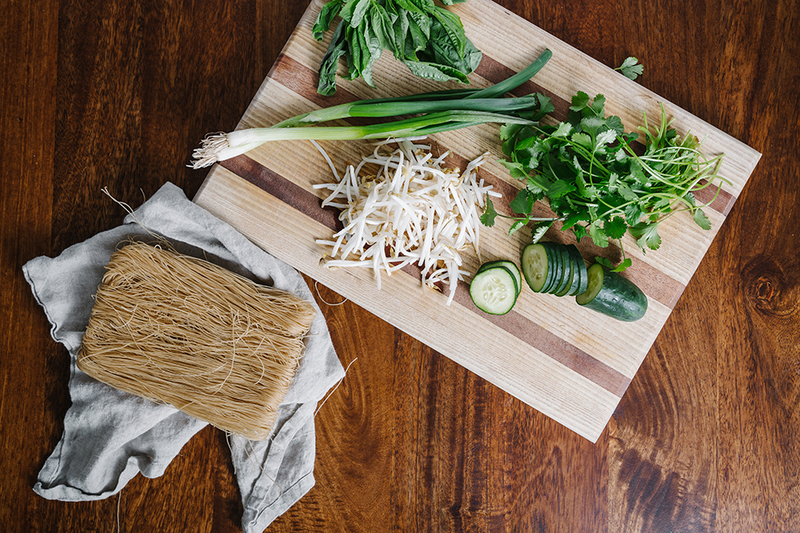 *Use this recipe to pickle daikon and carrots. yum!! 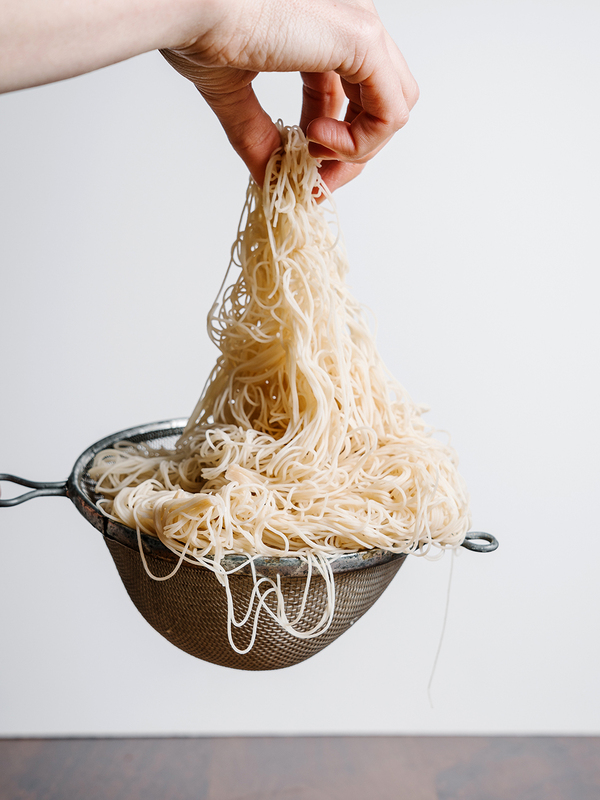 WHat brand of brown rice noodles do you like? Let me ask Lauren! I really like Lotus Foods but not sure which ones she uses.